A rapid fire catch-up with Tourette Fishing head guide Mark Murray first published in Issue 1 of The Mission. 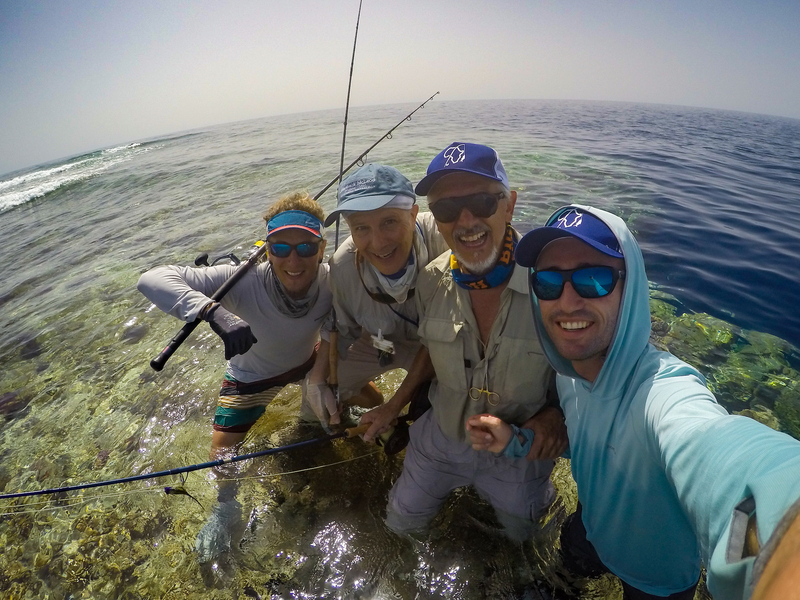 5 FISHING ITEMS YOU DON’T LEAVE HOME WITHOUT BEFORE MAKING A MISSION? My Patagonia Fly Fishing vest front-sling pack. Man, this pack makes my fishing missions so much better. I am a bit of a neat freak so having this pack makes my life a breeze. It keeps everything neatly organised and easily accessible. My Canon 7D Mark II camera. Pro Hunter manufactures small general-purpose scissors. They are very simple but so useful. They cut wire, plastic, braid, flyline… You name it and it will chew through it with ease. Ask anyone who’s fished with me and they will tell you about my blue scissors on a lanyard around my neck. In fact, I have them scattered all over! My car, my fishing bag, my running pack, to name just a few. Smith Chroma Pop polarised sunglasses. Good-quality waterproof watch. This might sound useless to some but not knowing exactly where you are tide-wise etc has proven lethal for me when fishing. I’m really big into trance and progressive, especially the live recorded stuff during the 2000 to 2004 period. So any Tiesto, Armin Van Buuren, Paul Van Dyk, Rank 1, Signum live sets will keep me psyched during the journey. For those who are not familiar with Capetonian producer Nate Raubenheimer you need to get on it straight away! Why take a boskak when you can AquaTurd? Pumpkin seed sunfish. Yeah that’s right! Tiny, aggressive and very colourful. I will fly to the USA just to catch one of those. I’m that guy. Those massive stingrays they get in Angola. I remember an old fishing article naming them rough tail skates. Not sure if this ray is the same kind they get in the Western Cape but it got me excited! My friend Edward Truter is still getting into the whole ray-fishing idea but I will have him converted one day. Those massive largemouth bass they get in Lake Ray Roberts, Texas. I know to a lot of people bass is more like a swear word than a fly target species, but I love catching them on fly. Spade fish, also known as batfish. I really love catching them on fly. We always try and get our guests to fish for them behind the mothership on the Nubian Flats but no one ever shows any real interest. That’s until the first guy gets reefed on his 9-weight on the first run. They are so much fun. Vundu catfish. Where I guide in Tanzania we are blessed with some really big catfish and most of the time you can sort of sight fish to them. Most guests obviously come to target the big tigerfish, but these cats are just savage. Imagine tiny shallow rivers, fast flowing water, and monster cats (100 ounds plus). Surely this would get anyone excited? Or maybe it’s just me. Jack Crevalle. 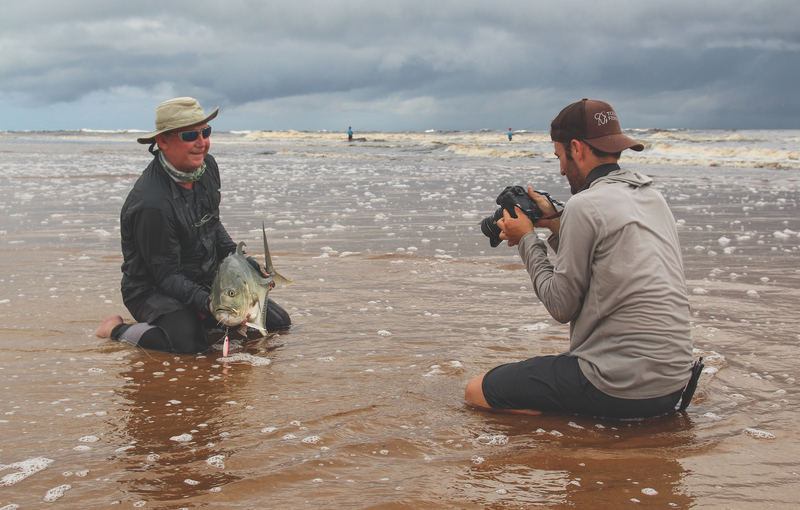 Wow, if you think GT’s are strong, then you have never bumped heads with these trevally along the coastline of Gabon. They might not be as dirty when it comes to finding reef like their Indian Ocean cousins, but damn, they will give you a proper run for your money. Run after run after run, deep into your backing… Add this fish to your list! Smallmouth yellows. This is a bit different, as there aren’t many anglers in South Africa that would call a yellow underrated. However, I think the greater fly fishing community around the globe needs to know how amazing these fish can be. Especially when you are sight fishing to them with dries. Smallmouth bass aka The Prince of the Shadows. Enough said. ECHO Switch Rods! They are so versatile and have so much application in South Africa. They make long casts in the surf and still waters so pleasant. You can roll cast in tight situations then use the same rod to quickly Czech nymph a set of rapids before banging another long cast in the next big pool. It is a must. 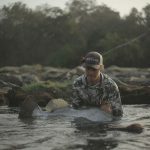 My fishing within South Africa is going to be dominated by fishing with switch rods over the next few years, especially along the coast, and as an alternative to float tubing still waters. My Salomon Sense Pro 2 trail running shoes. For those who don’t know, when I’m not guiding/fishing, I’m busy running up some mountain, or flowing through some forest trail somewhere in Africa. I love running and being outdoors so much. One of the kiffest runs I actually did this year was back in March while guiding in Gabon. The guests were sleeping after another crazy early-morning session and my legs were just itching to go for a run. So I ran on the fringe of the forest next to the beach for about an hour when I came across a whole heard of forest buffalo. It was so cool to see them just parking on the beach (sitting in the shallow water like they were a bunch a people on their December beach holiday) while the nesting African grey parrots were gossiping away in the forest canopy. I sat there for probably 30 minutes before I made my way back to camp. Yoga, Try this after a long day’s work. Loads of clients carry way too much gear with them. Backpack, waist pack, three rods, 10 spools of tippets, 5 000 flies, heavy bulky boots, necklace with more tools than most dentists use in their practices. Keep it simple! We are not going on a self-supported, three-week hike into some battlefield. More often than not a small box of flies, two to three spools of tippet/leader and a spare rod is more than enough. 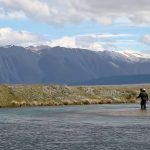 I often see guys really battling to walk in the rivers/saltwater flats because of all the heavy gear they are dragging along. Practice your casting before going on a trip. Even if you are a great caster. This will make your trip so much more pleasant. Often I see guys only nailing casts on the second or last day of their trip which could have made for a much more enjoyable experience. Make sure to read the recommended tackle lists before going on a trip. You will be surprised how many guys come with the wrong stuff. eg: small Bonefish Charlies to catch 20-pound tigerfish in Tanzania, for example. Managing their expectations. I know it’s really exciting going on your dream fishing trip, and yes, I get crazy excited as well, but make sure to keep your expectations realistic. I have yet to find the destination where you smash fish from 8am to 5pm, every day, all season long. Have faith in your guide. He knows the fishery pretty well, and is there to help you get the best possible fishing for your time on location. He’s not gaining anything from you not catching. Remember that. I only have one and that’s the Girdle Bug. I’m not sure what it does and why, but it’s deadly! The neighbour’s cat. I was teaching my girlfriend to cast on the lawn (she is actually really good, April Vokey beware!) when the neighbour’s cat arrived. Let’s just say casting a bunch of hookless feathers to inquisitive cats can be really exciting. 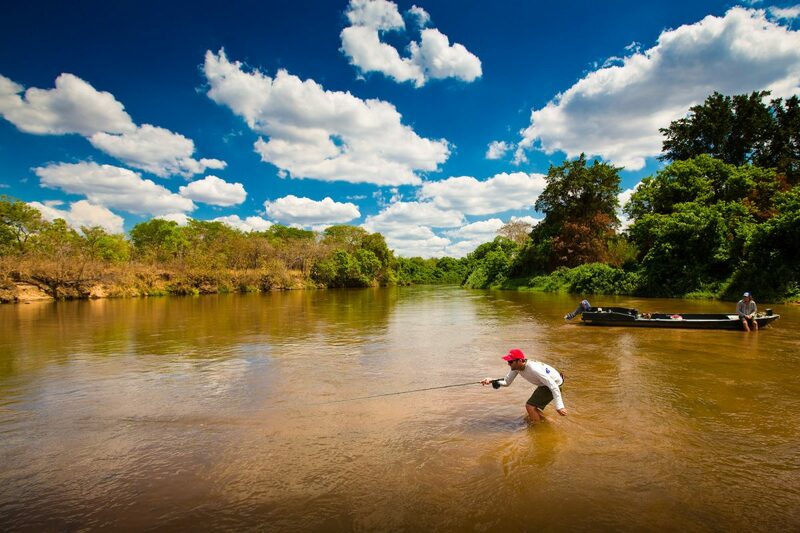 But before that I did cast to tailing carp in the Umzimkulu River… Man, those fish are just so addictive.